So, I was nearly crushed by a cement truck today. It came around a corner, at about 40km/h, without indicating. I was doing just 25km/h on my bike, which was fortunate, as otherwise I probably would be writing this from a hospital bed, or from a comfy freezer down at the neighbourhood morgue (do they have wifi?). Perhaps he’d stepped in some cement during his delivery run, and found it hard to ease off the accelerator pedal. Whatever the case, I don’t want to lay all the blame for this near miss at the feet of the driver. 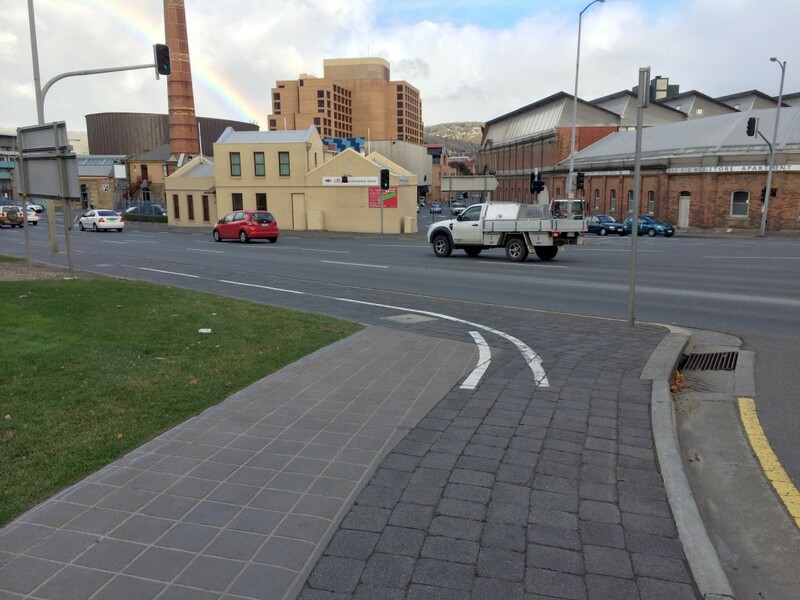 The site in question is the Boral Concrete Depot, through which the cycle route happily wends its way, and is probably the most dangerous of the obstacles which the intrepide commuter cyclist must negotiate on his or her way out of Hobart City. But it is by no means the only obstacle. 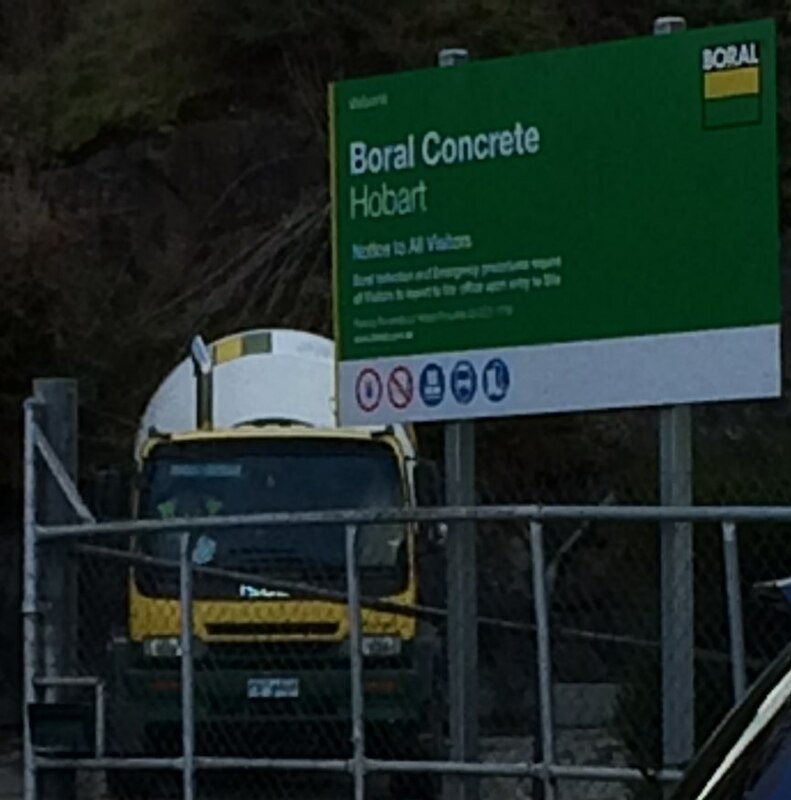 I was proceeding on my pedal cycle in a Northerly direction, at approximately twenty-five (25) kilometres per hour, through the Forecourt of the Boral Concrete Depot, upon the principal cycle route as shown on Council Maps, and paying due attention to traffic on the adjacent Highway, when my attention was caught by an approaching Cement Mixer Truck (henceforth, CMT). Said CMT was proceeding in a Southerly direction at a speed which I estimate at no less than forty (40) kilometres per hour, and as CMT had not indicated that it would be leaving the aforementioned Highway, I presumed that it would continue past the entrance into the forecourt. To my surprise, when the CMT reached the entrance of the Forecourt, it abruptly swung off the Highway and into the Forecourt, at speed, at which point I executed Evasive Manœuvres, to wit, braking sharply and turning my vehicle (2 wheeled pedal cycle) towards the West. Additionally, I immediately alerted the driver of CMT to the impending danger with a carefully worded, shouted, phrase. CMT then braked heavily; however this action was no longer necessary as I had already averted the danger with my Evasive Manœuvres. I then proceeded, unharmed, on my journey, albeit with an elevated heart rate (see Figure 1 – ed). The Intercity Cycleway is by far the most established and concrete (there’s that word again) piece of bicycle infrastructure in Hobart. 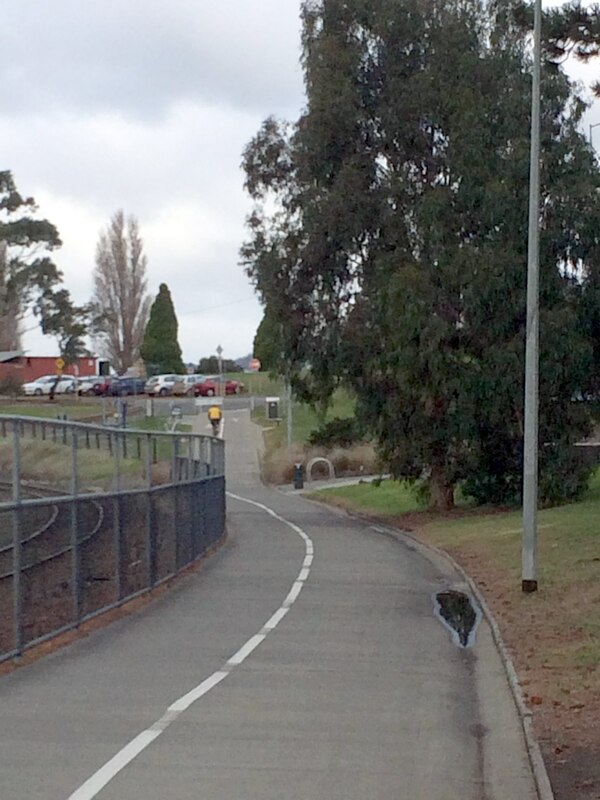 Following the railway line North from the Docks, through Moonah, Glenorchy and Montrose, it is used by hundreds (in Summer, thousands) of cyclists a day for commuting and exercise. And until you reach the Cenotaph, it is, by and large, a decent piece of cycle infrastructure. I think a good question to ask when looking at bicycle infrastructure design is: is it safe for an 8 year old to ride? 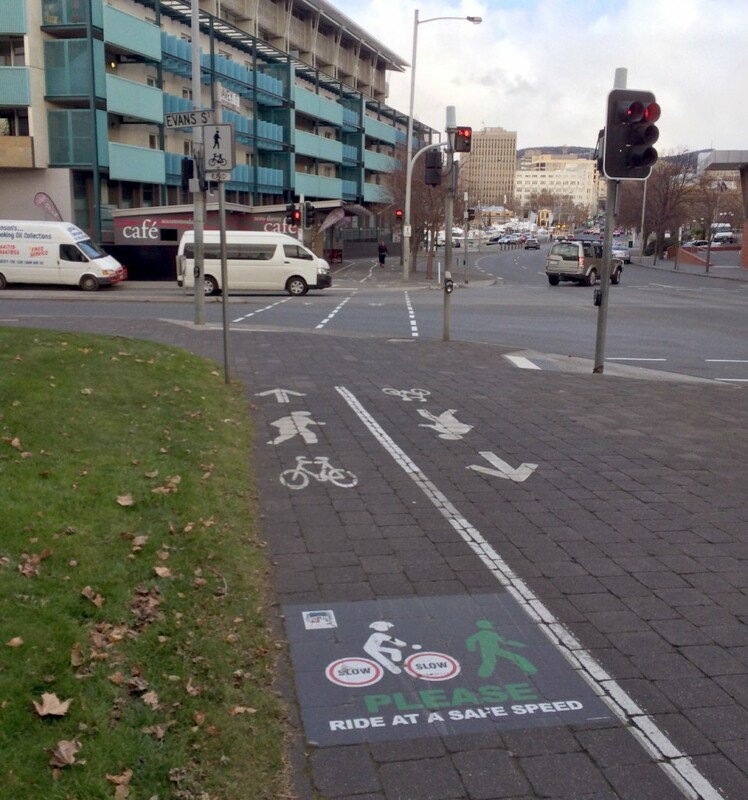 Not necessarily unaccompanied, but looking more at bicycle control and potential danger points. And at the Cenotaph, things start to go downhill. First, we encounter a confusing road crossing, up-hill, with traffic approaching from 4 different directions. The confusion is mitigated by typically low speeds, but it’s not a good start. After crossing the road, a cyclist is presented with two possible routes. The official route heads slightly up hill, and a secondary route heads past the Cenotaph. All well and good, almost. The “almost” comes into play shortly. The official route turns abruptly at the edge of the highway, where traffic is passing at 70km/h. There is no safety barrier. Here the path goes downhill, literally. The typical cyclist picks up a bit of speed here, coasting down the hill. We reach the other end of the Cenotaph route. This point is just plain dangerous, which is no doubt why the newer, ‘official’ route was introduced. However, without signage or recommendation, there is nothing to encourage riders to use the slightly less dangerous, slightly longer route. So what’s the problem? Mind you don’t miss the corner! 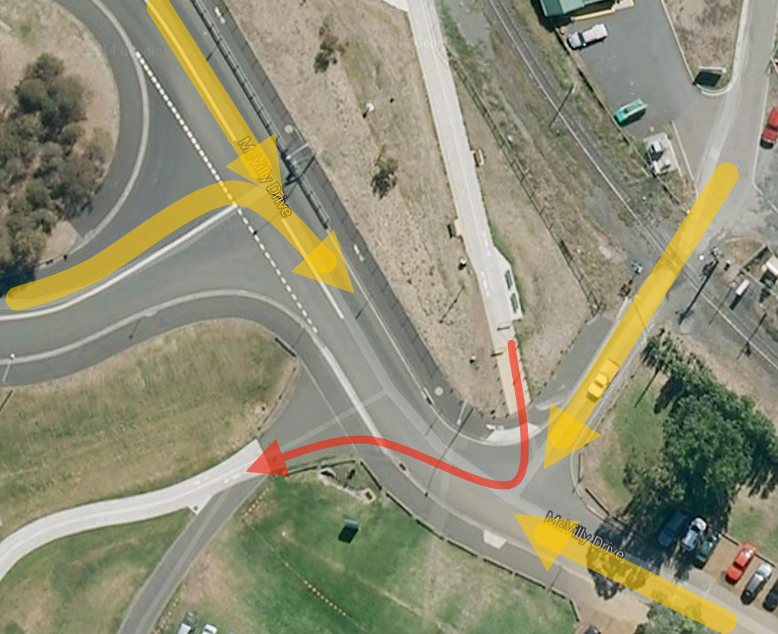 There is a conflict point with cyclists merging, at speed, coming down hill both on the official route, and the Cenotaph route. 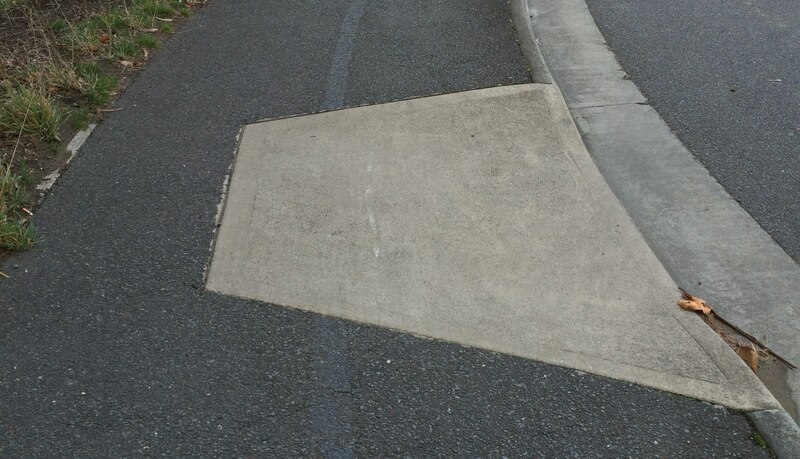 This can be a conflict with pedestrians as well. 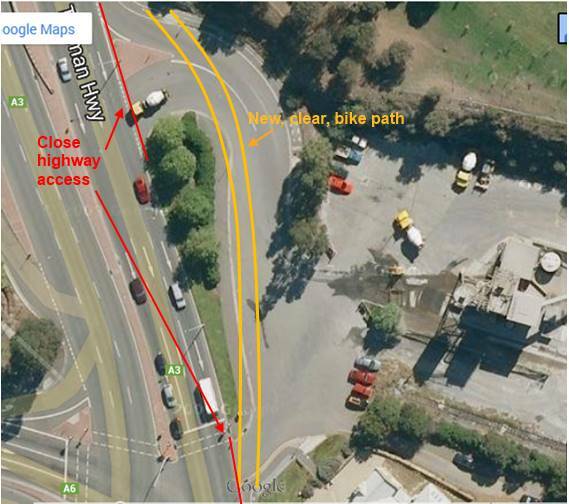 Worse, cyclists coming down the Cenotaph route run a significant risk of overshooting, if not careful, into the highway. I have seen a cyclist do this. They were lucky: no cars were in the near lane. Now we approach the bottom of the hill, with a blind corner. 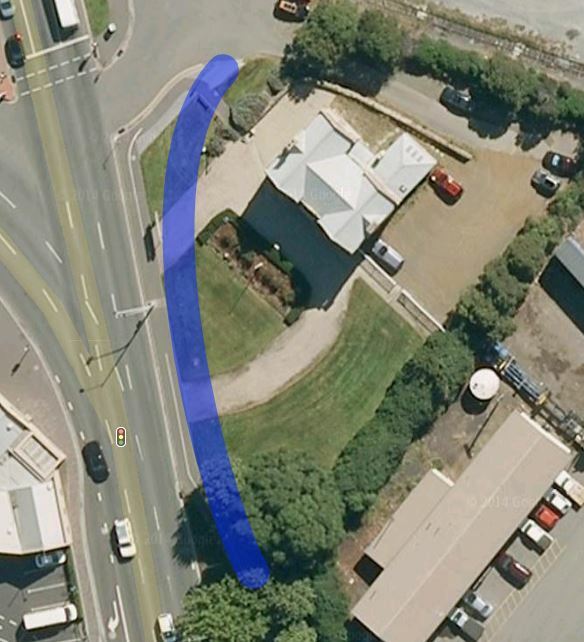 Pedestrians regularly round this corner on the “wrong” side of the shared path. 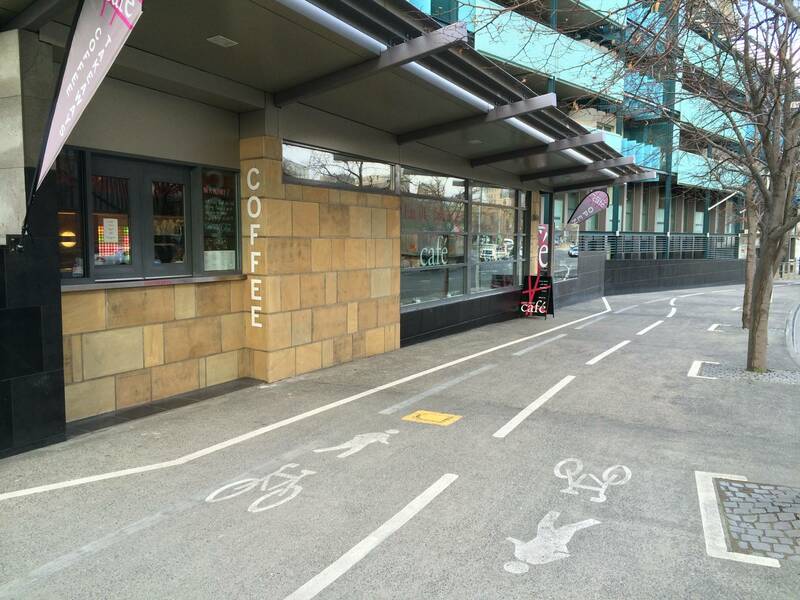 Cyclists should ride their brakes down here to avoid picking up too much speed. Confusion ensues: there are three marked routes here. Which is the proper route? The only frequently used route is the closest exit onto the forecourt roadway. But this exit is also the most dangerous, as I found today. The two more distant exits are just awkward to access. This forecourt is dangerous: with traffic entering from the highway, potentially at speed, and trucks turning and reversing, it’s just not a great place for bikes. 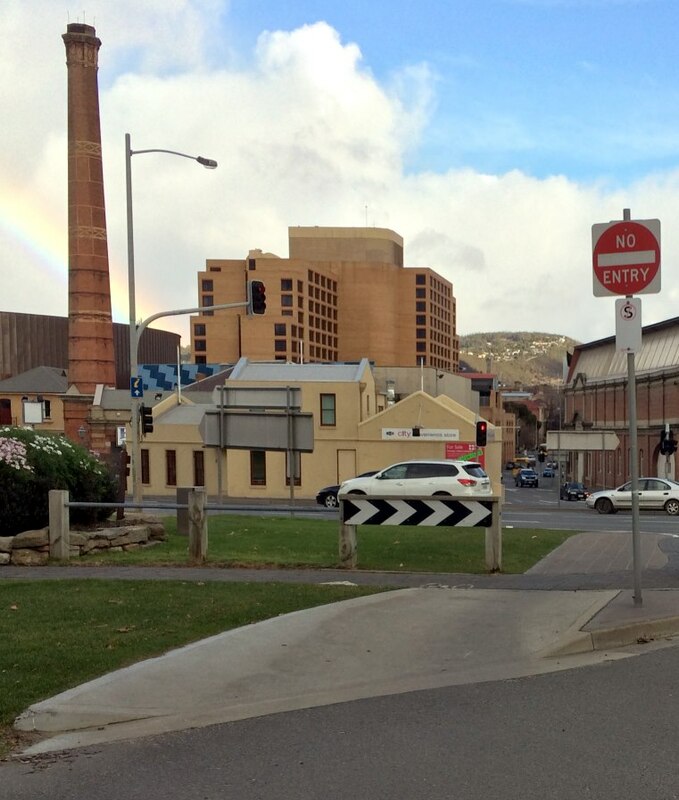 Yet it is smack bang on the primary bike route into Hobart. Things improve a little on the far side: we have a reasonably well marked pathway, albeit with another sharp corner right on the edge of the highway. Turn Hard Left. This does not qualify as high quality infrastructure, sorry! 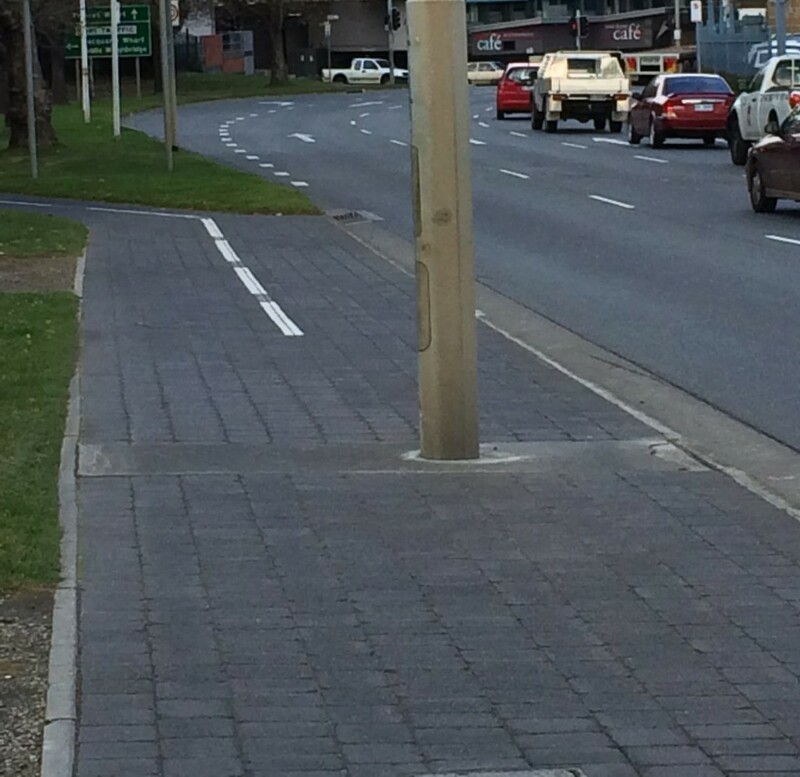 Now we are faced with a traffic light pole in the middle of the path, narrowing the path in one direction to less than a metre right beside a very busy roadway. That’s nasty. The next section, however, is quite pleasant, offset from the road and through an avenue of trees. Apart from some minor maintenance on the ‘cobblestones’ to level them out, I have no complaints. 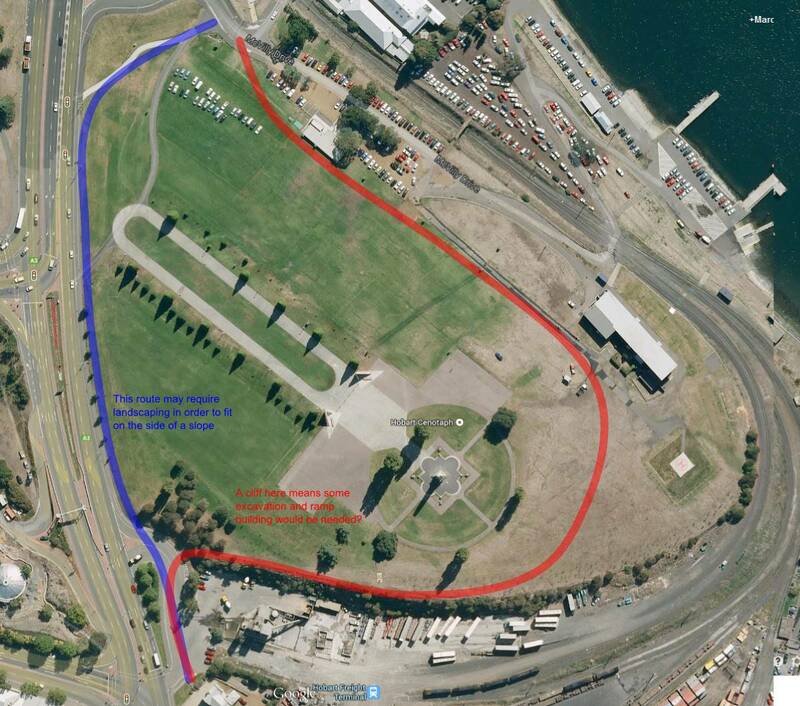 Now we come to the Hobart Docks precinct. First we have a road crossing, with a separate light for and control system for bicycles. I’m not sure why. 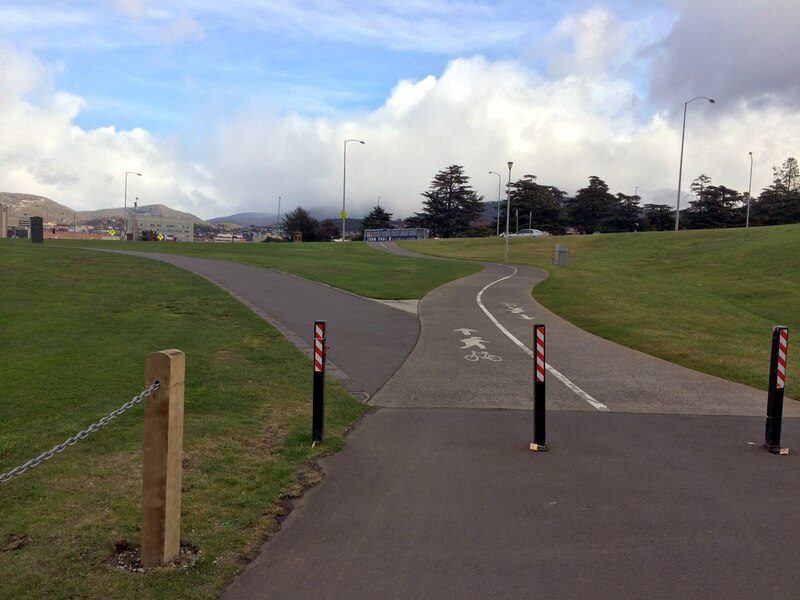 The button is on the wrong side of the path, causing conflict for oncoming bicycles. Enough has been said about the placement of this Cafe. 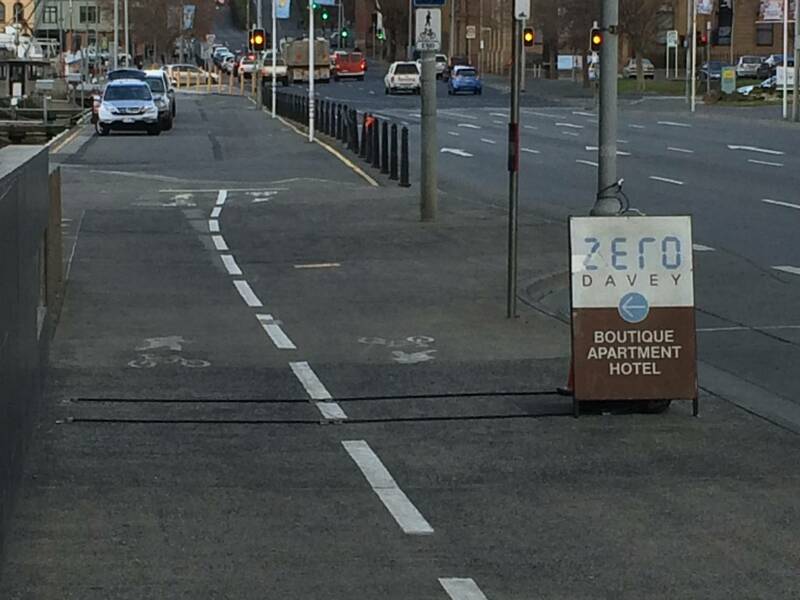 But perhaps the signs which frequently encroach into the bike lane (not too badly in the photo today, but worse on other days) should be relocated. Crossing the docks themselves is not ideal, with a path shared with pedestrians and parking cars. But it is a low speed area and most of the conflicts are overcome without too much trouble. 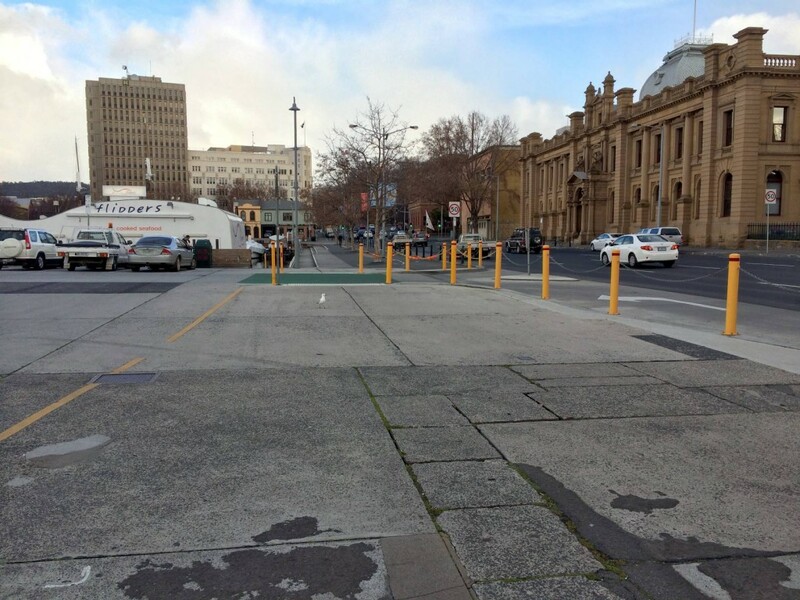 However, the Mures carpark entrance is still dangerous, even with the upgraded crossing treatment. Sight lines are poor and I have observed drivers crossing this intersection at speed, attempting to make it into a break in the traffic on Davey St. 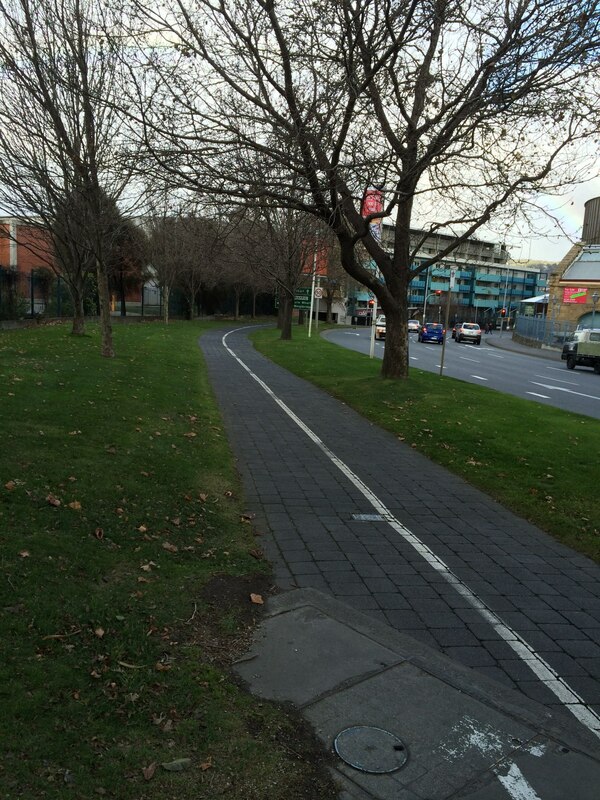 Finally, we have another shared path, with a somewhat ambiguously marked bike lane on the street side of it. 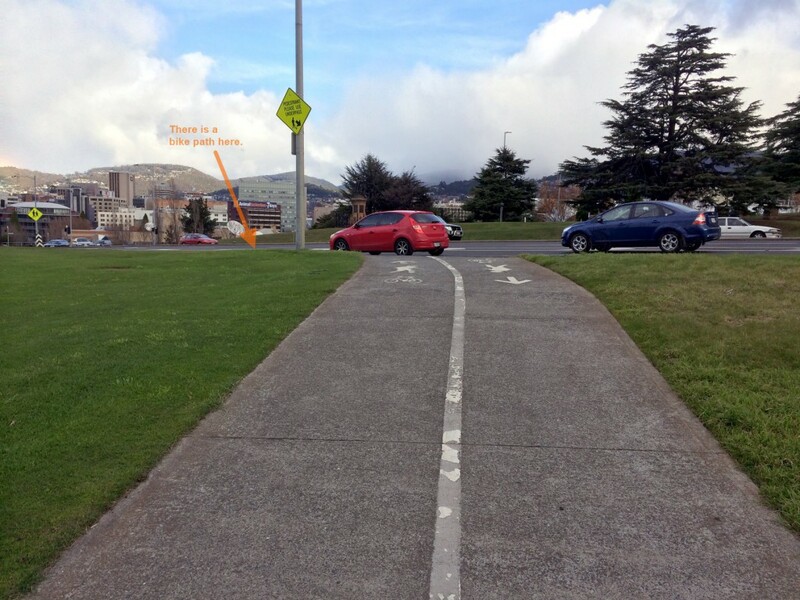 Perhaps it would be better to treat the whole path as shared, and not ‘reserve’ a section for bikes if it isn’t going to be clearly marked, but it’s not a big issue. 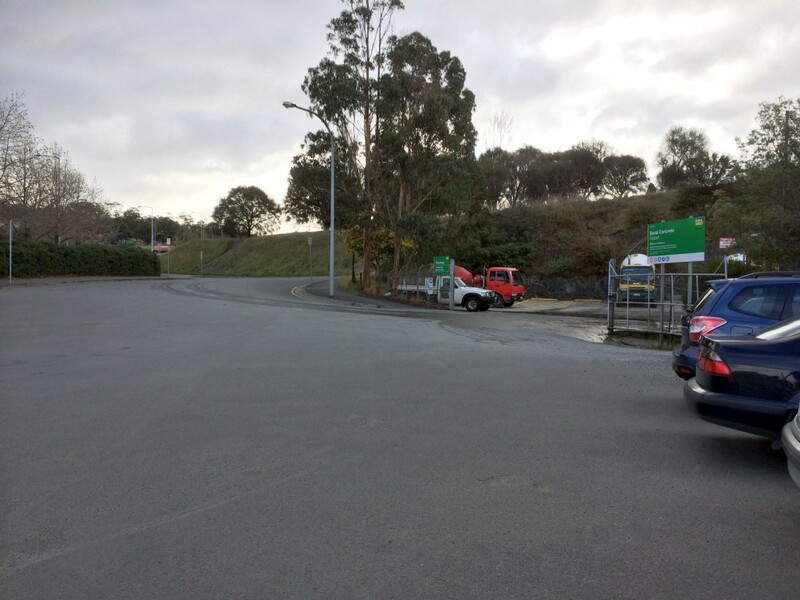 The sections of the track that need attention most urgently are those along the edge of the highway, and where the route crosses the Boral Concrete forecourt area. 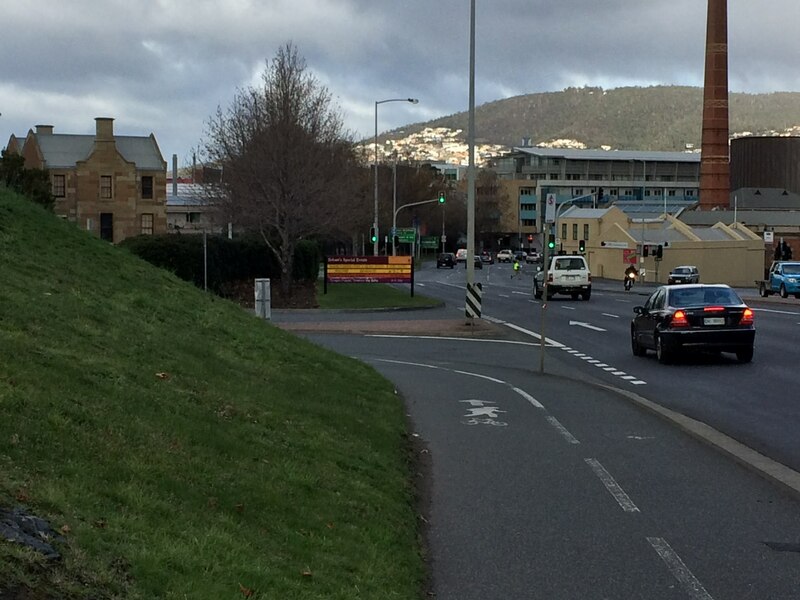 Travelling from the city this time, the first danger point, where the path traverses the edge of the highway and narrows around the traffic light pole, could be improved by shifting the bike path away from the edge of the road, and across the otherwise empty lawns outside the Engineers Australia building. No doubt there are some property boundary issues there. But perhaps it wouldn’t hurt to ask them? Even a one or two metre setback would improve the situation considerably. 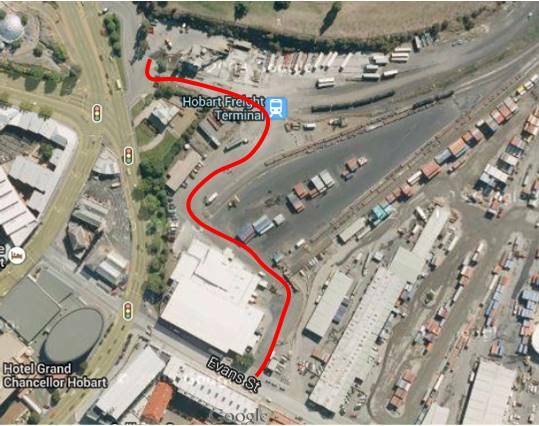 The safest solution to this area would be to close the car and truck access to and from the highway entirely, and reroute traffic to Boral Concrete and the Engineers Australia building through the dockyards. This would also address the problematic entrance of vehicles onto the highway in the middle of a major intersection. 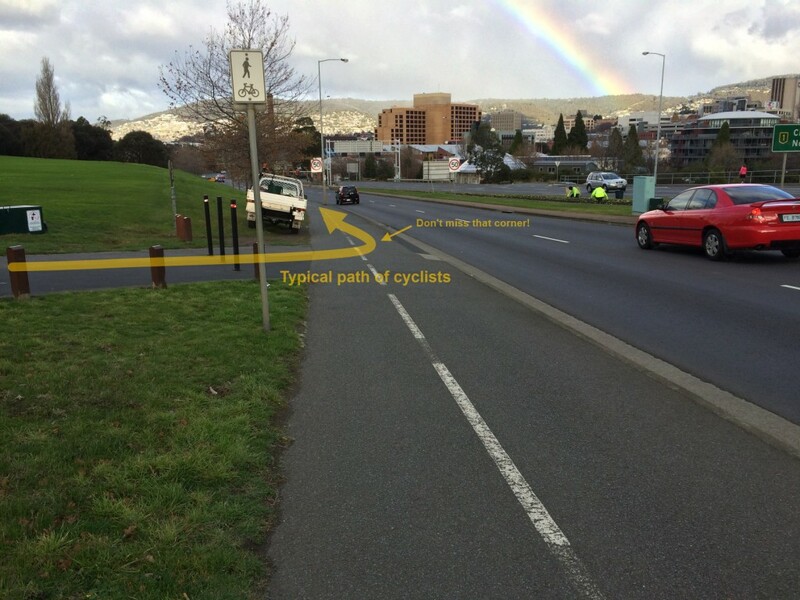 This may be a hard sell, however if the Hobart City Council wants to increase the bike share into the city, it will need to take serious steps to improve the safety of this primary route through this area. The bike path along the side of the highway could be rerouted behind the Cenotaph, or with some work, shifted away from the edge of the highway. Alternatively, a safety barrier could be put into place along the path beside the highway. 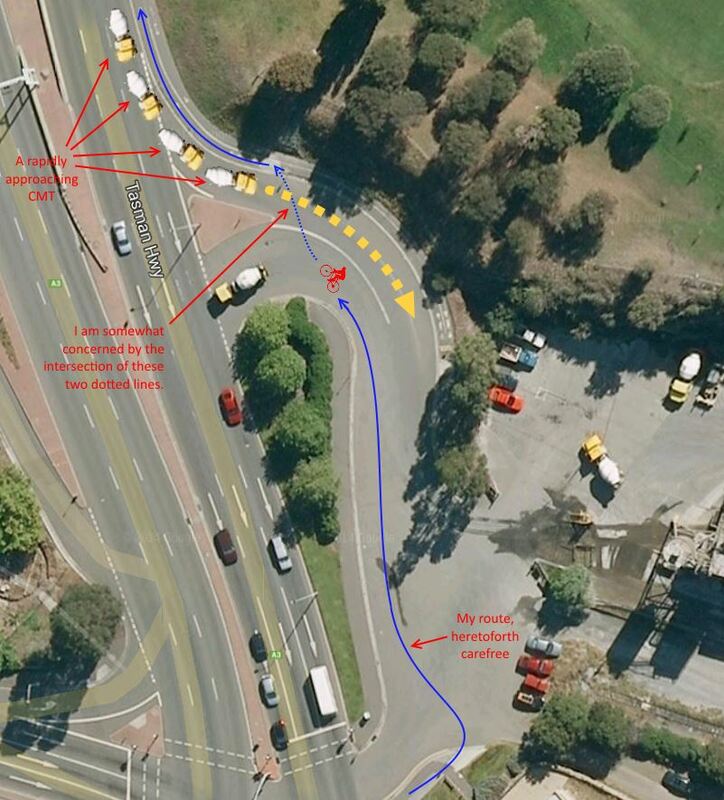 However I would like to point out technically you shouldn’t be on that road out the front of the cement place and you should go on the path right next to its entrance and then continue along that rather then that other on ramp where you almost got hit! why is that first ramp there if it is not intended to be used?